Holiday and winter market season is ramping up in the Queen City, and the list of options grows each year. 10 a.m. – 9 p.m. Park Expo & Conference Center, 800 Briar Creek Rd. $13. One of Charlotte’s most anticipated events, the Southern Christmas Show is celebrating its 51st anniversary with a ‘Fashionable Christmas’ theme from November 8 – 18. Feel like you’re strolling through Manhattan with whimsical Christmas windows filled with holiday trimmings turned into stylish décor plus a southern chic Rockefeller-inspired tree! Whether you’re craving piping hot strudel, marveling at beautiful holiday décor or seeking out the perfect gift for a special someone, this is the place to do it. 9 a.m. – 4 p.m. The Fillmore, 820 Hamilton Street. $7 early bird, $2 general admission. A Charlotte staple, Vintage Charlotte (otherwise known as VTGCLT) boasts the best of the best in vintage and handmade. The 60+ vendors are hand-selected through a rigorous vetting process, and there’s no doubt that the line will be out the door. Food, coffee, and beer will be available (from The Dumpling Lady, OooWee BBQ, HEX Coffee and more), so make a day of it. Shop early from 9 a.m. for first dibs before the crowd gets there at 10 a.m.
9 a.m. – 3 p.m. 300 N. Tryon Street. $1 entry fee. From the folks who brought you Esther + Elsa Retail and Charlotte Center City Partners, Uptown Flea is new to the vintage scene and has taken it by storm. With 80+ vendors, live music and little pockets to just hang, Uptown Flea is a great way to spend your Saturday. 12 p.m. – 11 p.m. Red Clay Ciderworks, 245 Clanton Road. Free. In conjunction with their cider celebration, Red Clay Ciderworks is bringing on a handful of talented vendors to showcase during this exciting fall event. Enjoy cider pressing (bring your own container! ), live music and kids activities like pumpkin painting make this an all-around fun experience for the whole family. Fresh juice will be available for purchase, as well as cake pops, hot mulled cider and dumplings from Momo Truck. Enjoy a day in downtown Belmont (just a few miles south of Charlotte) touring historic Stowe Manor and shopping with artisans and antique dealers. You’ll find vendors like Worthy Figures and Pickled Penny Designs. Open daily at 11 a.m. (Closed Mondays except Christmas Eve). Corner of 7th St. and N. Tryon St. Free. This quaint, European-inspired holiday market has become a Charlotte Christmas tradition. Look forward to sipping Glühwein, visiting Santa, enjoying specialty foods like glazed nuts and strudels, playing themed trivia, listening to holiday music and more. 1 p.m. – 6 p.m., Lenny Boy Brewing, 3000 S. Tryon Street. Free. 1 p.m. – 5 p.m. Bold Missy Brewery, 601 Anderson Street. Free. Partnering with Queen City Makers, shop small at Bold Missy Brewery. Queen City Makers put on a great show with talented vendors. Grab a pretzel and a strong-female-inspired brew. 11 a.m. – 5 p.m. Historic South End. Free. Make your way around town combatting big business by shopping small in South End. Kick off your holiday shopping season by perusing local shops, restaurants and breweries in South End at three different one-day-only pop-up markets, featuring local and handmade businesses. Find the three festival hubs at Camden Road (at W. Worthington Ave.), 2525 Distribution Street and Lincoln Street (between Church and South Mint streets). 9 a.m. – 4 p.m. Anne Springs Close Greenway, 104 Adventure Rd. Fort Mill, SC. Free for Greenway members and children under 14; $5 entry fee for non-members. Shop more than 150 artists and crafters from the greater Charlotte area for unique holiday gifts and decorations, including pottery, jewelry, quilts, handbags, woodwork, candles and more. There will also be live music, and you can even enjoy a “Sip & Shop” bar on the grounds, where you’ll find hard cider, wine and beer from 11 a.m. – 3:30 p.m.
11:30 a.m. – 5:30 p.m. Petra’s, 1919 Commonwealth Avenue. Free. Explore what Charlotte has to offer at Plaza Midwood’s “best little pop-up.” Taking place at Petra’s Bar, this Sunday afternoon market is just what the doctor ordered. Check out Thrift Magnet, Penninyay, Fjord13 Specimen and others for all your gift-giving needs (and of course, sip a Bloody Mary or mimosa while you shop). When you’ve worked up an appetite, you can grab some food from Lady Go-Go’s food truck. 11 a.m. – 6 p.m. Thursday – Saturday. 11 a.m. – 5 p.m. Sunday. 220 N. Tryon Street. Free. This week-long uptown shopping event features accessories, clothing and Charlotte-specific gifts, like those from CLT Find and 704 Shop. Coordinated by Center City Partners, this retail experience is sure to engage the senses with fragrances from Mallory Candle Co., coffee from Queen City Grounds and wine from The Assorted Table. Friday and Saturday November 30 – December 1, December 7 – 8 and December 14 – 15. The Olde Mecklenburg Brewery, 4150 Yancey Rd. Free. Make your way to the famous annual Weihnachtsmarkt at The Olde Mecklenburg Brewery on Fridays and Saturdays in December to shop local vendors, enjoy traditional German food, drink spiced wine and world-class beer and get into the holiday spirit with a bit of German flair. 10 a.m. – 5 p.m. Summerbird Boutique, 2424 N. Davidson Street, Suite 105 A. Free. Shop local this holiday season and enjoy a day perusing 40+ vendors selling an eclectic, curated mix of local art, vintage items, one-of-a-kind jewelry, home decor, clothing and so much more. Grab a cup of coffee at Amelie’s and join vendors and shoppers in the atrium of the Summerbird Boutique. 5 p.m. – 10 p.m. Camp North End, 1824 Statesville Avenue. Free. Shop Vintage Charlotte handmade and vintage vendors at this multi-faceted event at Camp North End. Shop local from 25+ local vendors, pop into 10 different holiday parties thrown by shop owners, squeal at the adorable parade of dogs in sweaters (!!! ), listen to Charlotte Storytellers annual showcase, warm up with a holiday movie at the indoor beer garden or grab a beverage from Hex Coffee or NoDa Company Canteen. 12 p.m. – 6 p.m. Lenny Boy Brewing, 3000 S. Tryon Street. Free. SHiFT Charlotte is hosting a free mind-body-spirit family friendly shopping event this holiday season. This holiday pop up market is host to over 50 incredible unique and local vendors with a full Psychic Fair thrown in. Bring the family to browse, to get a reading, or to enjoy the food and drink at Lenny Boy Brewing. 12 p.m. – 4 p.m. Divine Barrel Brewing, 3701 N. Davidson Street. Free. Stop and shop at Divine Barrel’s Holiday installment of NodaHood Market. Check out the 20 vendors displaying their goods and services, breakfast from Chop & Chisel, a yard sale, Rhythmic Yoga in the brewhouse at 11 a.m., live music, beer and coffee. 12 p.m. – 5 p.m. Resident Culture Brewing, 2101 Central Avenue. Prices vary. Resident Culture Brewing will host a market, free photos with Santa for your children or dogs and stations to make Christmas light balls for hanging on your trees or adorning your yard. The Plaza Midwood association is putting on this event, and it’s sure to be a great day of Christmas cheer. 10 a.m. – 5 p.m. Cabarrus Brewing Company, 329 McGill Ave NW Concord, NC. Free. 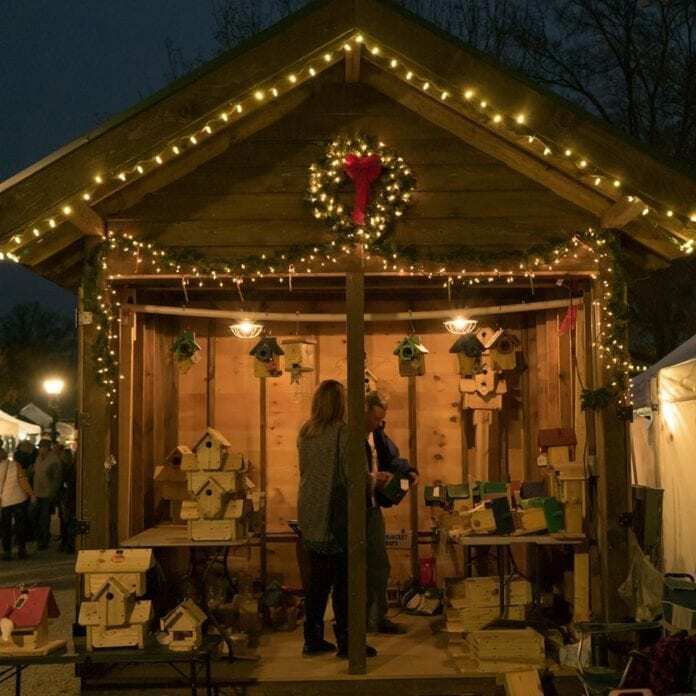 Shop 100+ local vendors selling handmade crafts, jewelry, art and more and find the perfect gift for that special someone at this annual Christmas market in Concord. There will also be a Santa letter writing station and hot chocolate for the children, as well as plenty of beer to keep the adults warm! 6 p.m. – 9 p.m. Mint Museum Randolph, 2730 Randolph Road. Free. Find gifts from some of the area’s local and unique retailers while tasting small bites from local high-end restaurants. The event is free to attend, so come and shop and eat for free and experience a special viewing of the newest exhibit, African-Print Fashion Now! A Story Of Taste, Globalization, And Style. 5 p.m. – 9 p.m., 101 W. Worthington Avenue. Free. Take this night out for yourself in the design district of Historic Southend. Hosted by Esther + Elsa Retail, this will no doubt be a cozy and warm evening of intimate shopping. 11 a.m. – 4 p.m. 2008 Commonwealth Avenue. Free. Shutting down Commonwealth Avenue, 60 venues will line the streets with their goods. Bring the family and your dog, stop in local eateries for lunch or Undercurrent Coffee for a warm beverage to keep you going. 12 p.m. – 6 p.m. NoDa Brewing, 2921 N. Tryon Street. Free. This unique market is brought to you by NoDa Brewing (get the “Hop, Drop ‘N Roll” pun, now?) and Crowned Sparrow Co. Sip on some craft beer while shopping crafty handmade vendors. You can find Ginger & Juniper, Purple Girl Designs by Amber, and M Designs, among many others. As always, TIN Kitchen will be onsite (I highly recommend the chickpea tacos). 9 a.m. – 3 p.m. 300 N. Tryon Street. $1 entry. You won’t want to miss Uptown Flea’s last market of the year with another round of stellar vendors, yummy food trucks and lots to keep you merry and bright at this glowing outdoor market. Shop this two-day market for pottery, accessories, jewelry, woodworking, paintings, pet supplies and so much more. Enjoy a delicious beer from Twenty-Six Acres and some sweet treats from Gingham Girl Cake Rolls, Sweet Cakes & Desserts by Molly and more. Saturday 10 a.m. – 5 p.m., Sunday 12 p.m. – 5 p.m. Price and venue details to come. One of the biggest shows in Charlotte is back at it with lots of vendors and opportunities to grab those last minute gifts or maybe even a little something for yourself. Stay tuned for details to be revealed here.